The Fleet Air Arm Museum at Yeovilton is an amazing day out and well-worth the trip across the border from Dorset. Like the Tank Museum at Bovington, the Fleet Air Arm Museum tells the true stories of people through machines. This meticulously presented collection is rightly proud of being Europe’s biggest and best display of historic Naval aircraft. Here not only can you learn all about Naval aviation and naval aircraft, but also “Boy’s Own” stories of the pioneering aviators who first flew their flimsy aircraft from land and sea. Boys and their Dads will probably rave about this museum more than their sisters and Mums, but even the girls find this massive series of exhibitions interesting and entertaining - and there is a whole section devoted to the role of women in the Navy past and present too. You can also guarantee you’ll come away knowing more about aircraft, the physics of flying and the history of the World in the 20th Century, which is all good for the those who are keen to support the national curriculum! The Fleet Air Arm Museum takes you on a journey from the earliest aeroplanes to supersonic flight, from aircraft made with wood and fabric to the most advanced passenger and military jets ever flown. Throughout the journey you are introduced to the exceptional people who flew, developed and maintained the planes in peacetime and in conflict. Sometimes those people are named individuals, whose faces look out from monochrome pictures. Others are interviewed on video screens. Some are just manikins in the uniforms of the day. All add to the atmosphere and understanding of this fascinating place and the stories it tells. You may ask what’s so exceptional about the people involved in the development of naval aviation? Today, we are used to seeing modern jets take-off and land at will on huge modern carriers. But the early days of the naval aviator coincided with the earliest days of powered flight itself. They also coincided with the Great War of 1914-1918. A little over a decade after Richard Pearce and the Wright Brothers succeeded independently in powered flight, men were flying machines with the flimsiest of construction over the battlefields of the Somme. They were also flying over the North Sea during the massive clash between the British and German Fleets at Jutland. Those earliest flyers were separated from the shells and bullets flying beneath them, and sometimes at them, by fabric the thickness of a silk scarf. And whilst their land-based contemporaries were having trouble enough getting to grips with flying and landing aircraft without killing themselves on airfields, the early pioneers of navy flying were being launched from catapults on ships and, believe it or not, submarines, as well as taking off and landing on water in float planes. Much of what these earlier daredevil pioneers learnt is still used today. And there are direct links between the history of the Fleet Air Arm and Dorset and its Coast. The first flight from a moving ship was in 1912 off the coast of Weymouth and the first landing on a purpose-built carrier was undertaken by a pilot from Dorset. 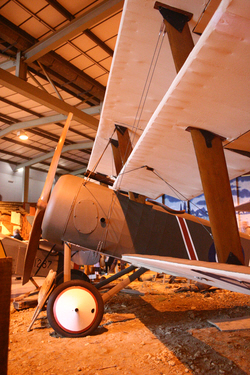 As much a museum of the Fleet Air Arm itself, as it is a museum of the machines it has flown, visitors can learn much about the role of its pilots in conflicts from the First World War, through the sinking of the Bismarck and attacking the Tirpitz in the Second World War, to the Korean and Falklands Wars. 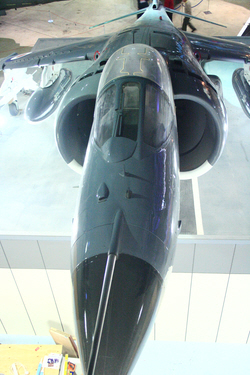 And with the recent addition of “Dirty Harry”, a Harrier GR9a from Britain’s now dismantled Sea Harrier force that saw action in Afghanistan, the display takes visitors right up to the present day. From start to finish the array of artefacts and aircraft is hugely impressive and the way they are displayed is both engaging and thought provoking. But there is also excitement. Without doubt, the thing that children and many adults will remember most about their visit is their trip to and through the aircraft carrier at the centre of the exhibition. Titled simply and effectively “The Carrier Experience” this huge mock-up of an aircraft carrier flight deck and central “island” are brilliant. In terms of the story of naval flying, this part of the journey marks a transition across the museum from halls predominantly concerned with propeller powered flight to jet and supersonic aviation. But it is also a journey in itself. You will “fly” in a real Wessex helicopter to the flight deck of the 1970s Ark Royal. You will stand on the flight deck as aircraft take-off and land and then you will be shown round much of the rest of the ship. This multimedia display is so well done, you will almost forget you are in a hangar in Yeovilton and not cruising the high seas whilst a fully operational aircraft carrier goes about its business around you. It’s very well done and boys, especially, love it! At the end of your trip around the carrier, you’ll go “outside” again on to the flight deck with all the wind and noise that goes with it, before being lowered into the hangars! From here you can progress to the “Leading Edge” part of the museum. This is where you will learn about the development of concepts we now take for granted, from vertical take-off and landing (VTOL) Harrier jump-jets, to the now defunct age of supersonic passenger flight. You can even walk through one of the original prototype Concordes, which is amazing. What is more so, is the aluminium plaques in the floor below the supersonic airliner, which show the length of the Wright Brothers first flight. They fit easily within the length of this fairly small, if very fast, airliner, and show just how far we have travelled since 1903. This is awe-inspiring of itself, but it also illustrates that almost every machine and artefact displayed here, and the history of every conflict and lifetime told in the Fleet Air Arm Museum, is a history that took place within living memory. And that really is a humbling thought. Although not as humbling as some of the stories themselves. Like that of William John Clinton, who, when under heavy fire during an attack on the Scharnhorst and other German ships in the “Channel Dash” of 1942, found that the fabric of his “Swordfish” torpedo bomber’s tail was on fire. He was seen to climb out of his seat and crawl along the outside of the fuselage of the aeroplane in which he was a gunner, to beat out the fire with his hands. Sadly he was one of 18 who died in an attack in which they were massively outgunned and out numbered. You owe it to yourselves, to your kids and to those whose stories are told here, to visit, to marvel and to remember. And on top of all the permanent displays, the Fleet Air Arm Museum offers an amazing programme of special events - not least of which is the “Dalek Invasion”. Not very historical, but loads of fun!The only thing that would make this an even better day out, would be joint ticketing with the Tank Museum! Oh, and provided you don’t visit on a weekend, there’s a reasonable chance (but no guarantee) that you may see modern aircraft of the Fleet Air Arm going through their paces on the runway right next door. The museum has its own indoor viewing area especially for this! Europe’s biggest and best display of historic Naval aircraft. Here not only can you learn all about Naval aviation and naval aircraft, but also “Boy’s Own” stories of the pioneering aviators who first flew their flimsy aircraft from land and sea." Magnificent model town that’s lots of fun to explore for young and old.